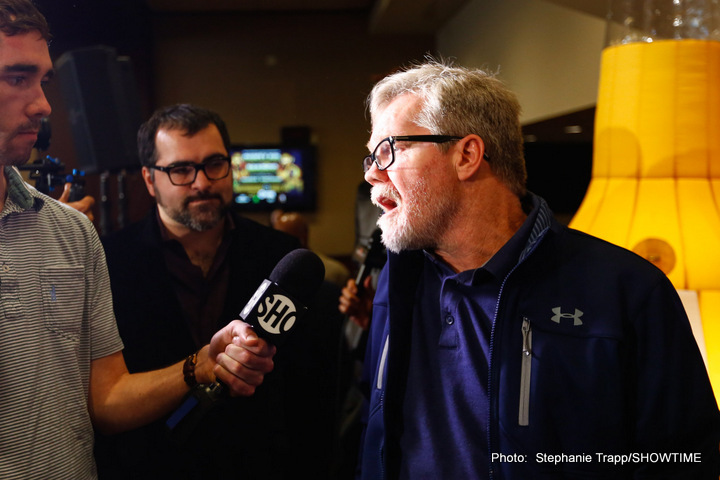 By Chris Williams: Manny Pacquiao won’t have trainer Freddie Roach in his corner for his still un-finalized fight against WBC World welterweight champion Lucas Matthysse on June 24 in Malaysia. In Pacquiao’s corner will be Buboy Fernandez as his lead trainer. Pacquiao probably knows enough from his years with Roach to be on cruise control at this point in his career. Even if Buboy Fernandez turns out to be a lesser trainer than Roach, Pacquiao should be able to get the most out of his ability in a fight against Matthysse. This is the type of opponent that Pacquiao thrives against. He doesn’t need Roach in his corner to do well against Matthysse. This Ricky Hatton 2.0 for Pacquiao, as long as the fight can be made. There are still some questions whether the Matthysse fight will happen or not. It would be a disappointment if Pacquiao doesn’t get the Matthysse fight and winds up facing journeyman Mike Alvarado. Fernandez’s first name is Restituto, and he’s been with for many years working as an assistant manager. Buboy is an assertive force in Pacquiao’s corner, which is what he needs at this point in his career. Pacquiao had been with Roach since 2001, and the two of them had enjoyed a lot of success before his loses to Floyd Mayweather Jr. in 2015 and Jeff Horn in 2017. Roach was well paid by Pacquiao. It’s unknown whether Pacquiao will be saving money by replacing him with Buboy. Roach was an invisible presence last July in Pacquiao’s fight against Jeff Horn in Brisbane, Australia. Roach wasn’t speaking with the referee in between rounds to have him address the roughhouse tactics the 29-year-old Horn was doing. We’ll soon see if the Pacquiao-Matthysse fight comes off. Pacquiao is the one that picked out Matthysse. This wasn’t a guy that Pacquiao’s promoter Bob Arum selected. Pacquiao vs. Matthysse wouldn’t be a huge fight in the U.S, but it might be a big deal in Malaysia if the money comes through for the fight to be staged there. Arum says he’s waiting for the $5 million upfront money for the fight. It hasn’t come year. If there is no money for the fight, then it’s anyone’s guess who Pacquiao will fight next aside from one of Arum’s Top Rank stable fighters. He wanted Pacquiao to fight Top Rank fighter Mike Alvarado on the undercard of Jeff Horn vs. Terence Crawford on April 14. In terms of being trained, Pacquiao (59-7-2, 38 KOs) had gone about as far as he could go with Roach as his trainer. It’s clear that Pacquiao needs some newer ideas from a trainer working his career. Whether Buboy has enough talent as a trainer to help Pacquiao beat the likes of Matthysse is unknown. Pacquiao is 39, and that fight could be a tough one. It’s still not signed though, so there’s a possibility the fight might not happen. Pacquiao’s long trainer promoter Bob Arum already has a backup opponent in Jose Carlos Ramirez that he would like to match against him if the Matthysse fight doesn’t happen. Ramirez is one of Arum’s fighters. Pacquiao would have to drop down to 140 for him to fight Ramirez. It would be interesting to have seen what kind of fights Pacquiao would have gotten had he not re-upped with Top Rank the last time. If Pacquiao had access to fighters like Danny Garcia, Amir Khan, Shawn Porter, Keith Thurman and Errol Spence Jr., you can argue that his career would be humming right now. You can only wonder how things might have been had Pacquiao dumped Roach and switched promoters ages ago. Instead of the stale fights that we’ve seen in the last 2 years for Pacquiao with him fighting Bradley yet again, Vargas and Horn, we might have seen him against some exciting fighters that the boxing public wanted to see him fight. The stale match-making has been brutal. It was to the point where Pacquiao looking at facing journeyman Mike Alvarado on the undercard of Horn-Crawford. I’m not sure if that was a hint for Pacquiao to retire or what, but it was a crazy idea.